Notice in the Gun versus Armor comparison that the Pershing 90mm 53 caliber gun could defeat the Panther D armor out to 2000 meters, while the Panther D 75mm 70 caliber gun failed to penetrate the Pershing armor beyond 600 meters. The Pershing 90mm 53 caliber gun could defeat the Tiger II (King Tiger) armor out to 1300 meters, while the Tiger II (King Tiger) 88mm 71 caliber gun could penetrate the Pershing armor out to 1800 meters - a pretty close match, with the Pershing having the edge in mobility. 3AD's "Super Pershing" vs. Germany's "King Tiger"
Only three days before the 3rd Armored Division's final combat action of WWII, a Super Pershing of the 33rd Armored Regiment met and defeated the most powerful and most heavily armored German tank of the war - the legendary 77-ton King Tiger, also known as the Tiger II or Tiger Royal. It would be the first and only meeting between a King Tiger and the Super Pershing, a modified standard M26 Pershing weighing 53 tons - an almost "secret" tank that, to this day, remains largely an enigma to military historians... (story continues). T32: Longer 90mm gun, 200mm armour max. T28: 105mm T5E1 High-velocity gun, 300mm armour max. Excellent post, thanks for all the information. Its a pity this tank couldnt have been in service before D-Day. I loved the 8 inch Howwitser version. Excellent tank if underpowered (which was the real hindrance to WWII US tank design, they seemed to have limited things to basically one engine, due to continuous and easy mass production). It would have been nice for the US Army to have had this as the center piece of their tank corp, and surrounded them with Easy-8 Shermans the way the Germans used Panthers and a few Tigers surrounded by lessor armor like the Panzer MkIV and Jadpanzer... I wonder how much faster the War would have drawn to a close? Extensive information! Great tank, that T95 looks a beast! Firefly, Nick, SS Tiger, you are most welcome. It took me a few evenings of my spare time to compile the information - a combination from books that I have and the Internet. If the Armored Force Board had not delayed development in September 1943, perhaps it would have been available in some numbers for the Normandy Invasion. I would like to have seen it take part in Operation Cobra or at the very latest the December 1944 Ardennes Offensive. She is a beauty. You can definitely see a resemblance to many post-war tank designs. Of course especially to the M46, M47, M48 and M60 designs. The Centurion is my second favorite tank to come out of WWII. As you say, both the Centurion and M48/60 tank designs continue to be upgraded even into the present day by the Israelis. An interesting variation of the Centurion is the heavy armoured personnel carrier version developed by the Israelis for their combat engineers. Pershing / Sherman and lighter AFV's land version of a naval task force (battleships and cruisers surrounded by destroyer pickets, etc.) - that would make for an interesting meeting engagement with their German counterparts. I also included a drawing with the Pershing and Sherman together for comparison. Thanks, it's my pleasure. Yes, I guess the T95 is an example of how things can get out of hand. I have even seen it in the PC game "Battlefield 1942" expansion "Secret Weapons." I am glad to share information like this to so many people on the Internet. I like that P-47 Thunderbolt in your signature. It's my favorite fighter of WWII. They look like they were all flown by aces. I count 7, 9 and 10 kills on the three planes. The top two must have been as they appeared late in the war with the aluminum finish. Wartime operators were Brazil, Free French, Mexico, RAF, Soviet Union, USAAF. 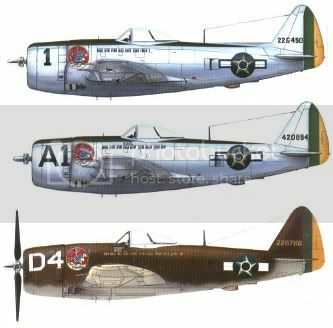 After the war P-47's were also operated by the air forces of Bolivia, Brazil, Chile, Columbia, Dominica, Ecuador, France, Guatemala, Honduras, Iran, Italy, Mexico, Nationalist China, Peru, Turkey and Yugoslavia. Thankyou George for your time and effort on the excellent info you've shared. The T-28 was the beastie i was thinking of. It really looked the part if not a bit impractical. Still, it was probably a bit more realistic than a Maus! You're welcome and thanks for the compliment. Here are some more pics of the T-28. Last edited by George Eller; 10-15-2006 at 12:29 PM. More pics of the T-28. Last edited by George Eller; 10-15-2006 at 12:30 PM. A few more pics of the T-28.